One of the pictures that decorated my bedroom way back in Hanover, Germany, was a concentric blue and black circle accompanied by triangles, squares, and straight and wiggly lines that look like the mast of a sailboat. Much later I learned that it was a lithograph by Kandinsky, part of his Kleine Welten (Small World) series dating from 1923. My mother must have picked the image up for a song. It was with much pleasure that I went to view the current exhibition at the Neue Galerie in New York entitled Vasily Kandinsky: From Blaue Reiter to the Bauhaus, 1910–1925. During the fifteen years covered by the show Kandinsky’s work evolved from representational to purely abstract or, as he described it, nonobjective. Born in Tsarist Russia, Kandinsky became a lawyer to please his father. Eventually he switched to art. He moved to Munich to study some more and to join contemporary German artists who were forging German Expressionism. Kandinsky’s legal studies, as well as his musical training, may have inclined him to be more theoretical than most artists. He believed that all arts—music, painting, and language—represented a continuum. Borrowing musical terminology, Kandinsky viewed his creations as “compositions” and “improvisations,” the former being carefully composed paintings consisting of harmoniously assembled geometric forms, whereas the “improvisations” included spontaneously painted abstract shapes. Kandisnky’s early works at the Neue Galerie are still representational. Street Scene in Murnau is rendered in brilliant primary colors that link it to the work of his colleagues in the Blue Rider group (1911–1914,) of which he was a founding member. Franz Marc’s Great Blue Horses, from the Walker Art Center, also in the show, illustrates this relationship. Viewing this magic painting alone makes a trip to the Neue Galerie almost mandatory. In these works both Marc and Kandinsky use a brilliant royal blue—traditionally the color of the Virgin’s robe—that imbues their works with spirituality. Gradually Kandinsky’s canvases became totally nonobjective. Composition Number V, a large canvas, is one example of this complete transformation. Kandinsky’s participation in the famous 1913 Armory Show, which celebrates its centennial this year, earned him an American following. The Neue Galerie show includes the four harmonious panels he painted for the Park Avenue dining room of Edwin R. Campbell, the founder of General Motors. 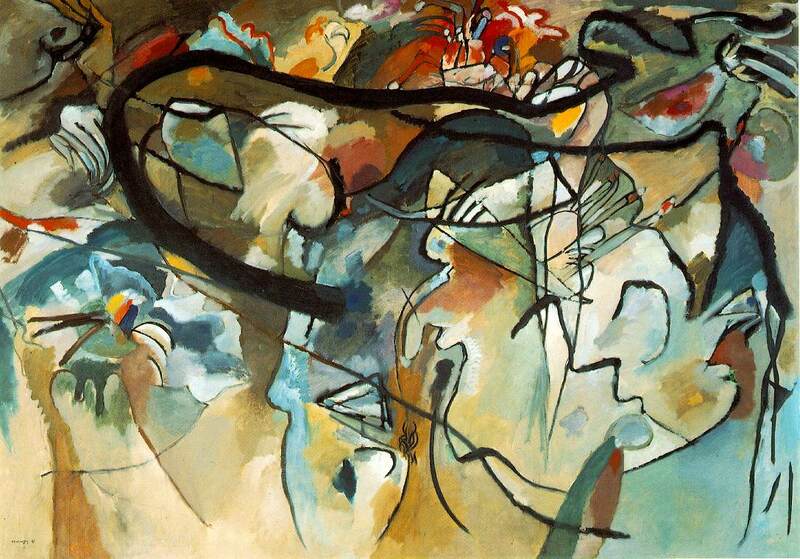 Kandinsky involuntarily returned to Russia during and after World War I. There, and after his return to Germany, his style became geometric. A portfolio of twelve lithographs, closely related to mine, is part of the exhibition, as is Black Form, 1923. The latter features an expanding green circle with geometric forms spilling across a large canvas. The carefully tinted shapes illustrate Kandinsky’s sense of color and design. Upon his return from Russia Kandinsky joined the staff of the Bauhaus, whose philosophy of all-inclusive art suited him to perfection. He closely related to Paul Klee, to whose minimalist, often nonobjective art he related. Kandinsky stayed at the Bauhaus until the Nazis closed it in 1933. The Nazis considered his work degenerate and destroyed important canvases. Within a mile of the Neue Galerie, the Jewish Museum has mounted a Chagall exhibition, featuring that painter’s work during World War II. Though Kandinsky and Chagall came from vastly different strata of Russian society, their lives were rather parallel and they considered themselves competitors. Kandinsky departed Russia in 1895, Chagall in 1910. Because they were Russian citizens both were forced to stay or return to Russia during WW I, where they survived and painted during the early years of the Soviet regime. After that war Chagall returned to France and Kandinsky to Germany. Chagall fled to the US during WW I returned to France in 1947. Both artists lived out their lives in France and in retrospect had done their most memorable work prior to the Second World War. 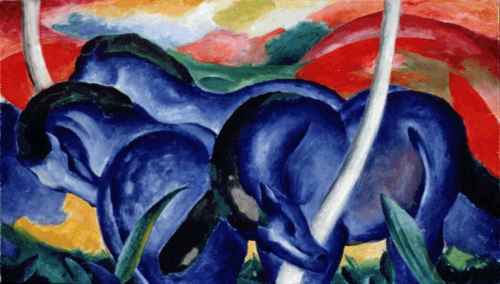 This entry was posted in Uncategorized and tagged 1913 armory show, bauhaus, blaue reiter, blue rider group, composition v, franz marc, german expressionism, great blue horses, jewish museum, kandinsky, marc chagall, modern art, neue galerie, new york city, nyc museums, the armory show, vasily kandinsky, walker art center. Bookmark the permalink.